iPod Log 4: (mostly) perky edition. Here I continue the tradition of sharing with my readers the pieces of music randomly selected by my iPod to play during some journey (this having been during a trip from my apartment via foot, subway and bus to the Metropolitan Museum of Art, where my daughter, her friend, and I were treated to a private tour by a former colleague and present friend of my wife, who is an art historian, and expert on Byzantine art). John Mayall and the Bluesbreakers, with Eric Clapton, It Ain't Right. Can the blues be perky? This rendition of a harp-driven Little Walter song shouts an affirmative response. J.S. Bach, Brandenberg Concerto No. 2, 1st movement, allegro, Academy of St. Martin in the Fields, Sir Neville Marriner conducting. Maybe the perkiest thing Big Daddy Bach ever composed. This red hot Cajun song isn't as jarring coming after Bach as you might suppose. Indeed, it seems to fit quite nicely. Très perky, aussi. Delbert McClinton, Dreams to Remember. Why did he hold you so tenderly? A fine example of the blues not being perky. Fairport Convention, Jack 'o Diamonds. Dirty Dozen Brass Band, Li'l Liza Jane. Classic New Orleans Dixieland brass with vocals, including some nimble scatting, doing a song I used to sing while marching in ROTC camp. This is from the excellent Rhino New Orleans Party Classics CD. Man, you talk about perky. Willie Nelson, Crazy. Very early Willie, done in the overproduced, deracinated "countrypolitan" style championed by Chet Atkins, but nevertheless his voice and delivery, and a great song that he wrote but was first made a hit by Patsy Cline, triumphed over adversity. Edith Piaf, La Vie en Rose Perky? Pour qui? Ritchie Valens, Come On, Let's Go. Valens was a fireball in the rock 'n' roll firmament: signed to his first record contract at the age of seventeen, within a year he had hits off both sides of a disc, "Donna" and "La Bamba" (the latter the first rock hit sung in Spanish), and died before his eighteenth birthday in the plane crash that also ended the lives of Buddy Holly and J.P. "The Big Bopper" Richardson. "Come On, Let's Go" was Ritchie's first record release. It is muy perky. The Band, Long Black Veil. Aretha Franklin, You Make Me Feel Like a Natural Woman. 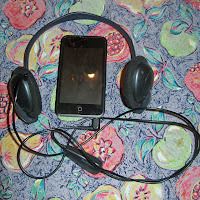 The iPod stays in a meditative groove with the Queen of Soul. W.A. Mozart, The Marriage of Figaro, Overture, Metropolitan Opera Orchestra, James Levine, conducting. So, my journey ends with an overture. And a right perky one, at that. Please help a City child. Bet the inmates had fun making this one. 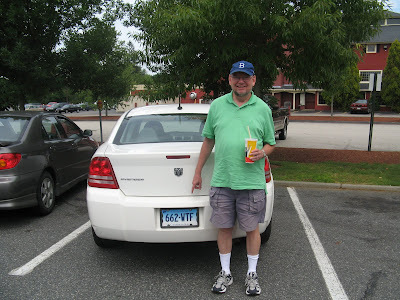 Yours truly in Mickey D's parking lot, Sturbridge, Massachusetts, on the trip back from Maine after dropping Liz off at camp. I got the car from Avis in Brooklyn, but it had Nutmeg State tags. I need to keep working on that paunch. More Bridge walks, less Cognac. Addendum: The car is a Dodge Avenger, and that's a name with a history. The first "Avenger" in the Chrysler family was made by Hillman, part of the British auto manufacturer Rootes Group, which was taken over by Chrysler in the late 1960s. Versions of the Hillman Avenger were marketed in the U.S. as the Dodge Polara and Plymouth Cricket. My second car was a pre-Chrysler Rootes product, a 1965 Sunbeam Alpine. [F]iring the manager isn't going to do the trick. Indeed, at least in the short run, I think it's likely to make matters worse. Well, in the short run, the Mets have a winning record since the Midnight (PDT) Massacre à trois, though it's an open question whether the change of managers caused this (perhaps a better theory, given the improvement in pitching, both from starters and bullpen, is that the change of pitching coaches made the difference), or whether we may just be seeing an instance of the Hawthorne effect. Indeed, one of the things (perhaps the principal thing) that makes baseball fascinating is the number of variables involved in the outcome of any game, or season. Recognizing this, I'm foreswearing any further attempts at predicting the Mets' (or any other team's) fortunes after the All Star break. *Demonstrating the enormous effect Shakespeare has had on the understanding of English history, Sellar and Yeatman, in their magisterial 1066 and All That, assert that there were two Kings Henry IV: Henry IV Part I and Henry IV Part II.